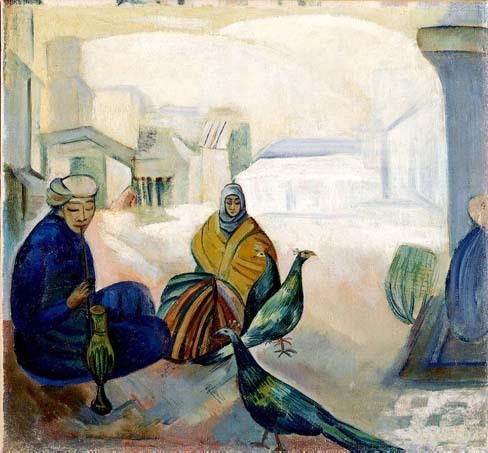 Pavel Varfolomeievich Kuznetsov (1878-1968) The Bird Market oil on canvas 55 by 59cm. We buy, sell and give advice about Russian paintings and works of art. Having been involved in the Russian market for so long, we know who is looking for what, and, more importantly, where it is to be found. We work as consultants and advisors, which means we also look at objects coming up at auction for clients. For this we charge a commission of 5%, but consider that if the client buys well, this is money well spent. And on the occasions we advise the client not to buy something (and for this we charge nothing!) we actually save the client a lot of money. In addition, we offer works of art, paintings, furniture, porcelain and icons for sale. Whether you need advice on how to achieve the right look for your neo-classical Moscow town house, or you just need an attractive lubok to hang in your kitchen, we hope to be able to help. The most satisfying aspect of our business is the close relationships we have been able to forge with collectors.